With this private, self-guided tour you'll enjoy the luxury of your own personal driver, car, and itinerary! Your driver will bring you through the city in your choice of vehicle. Cruise along the Freedom Trail as you dictate which stops you'd like to get out at and how much time you'd like to spend at each. Your driver is at your disposal! Start your 3-hour tour with pickup at your hotel or local accommodations, and set out to explore the Trail with your guide. Beginning in downtown Boston, the Freedom Trail is a 2.5-mile trail running through 16 different locations with significance to the birth and history of the United States. Explore the Boston Common and the Massachusetts State House, home to current lawmakers. Pass by the Park Street Church and Granary Burying Ground, final resting place of Paul Revere, Robert Treat Paine, and Samuel Adams. Visit King's Chapel and the Benjamin Franklin statue. Swing by the Old Corner Bookstore and Old South Meeting House, then visit the Old State House and the Site of the Boston Massacre. Walk through historic Faneuil Hall and grab a drink or bite to eat in historic Quincy Market. 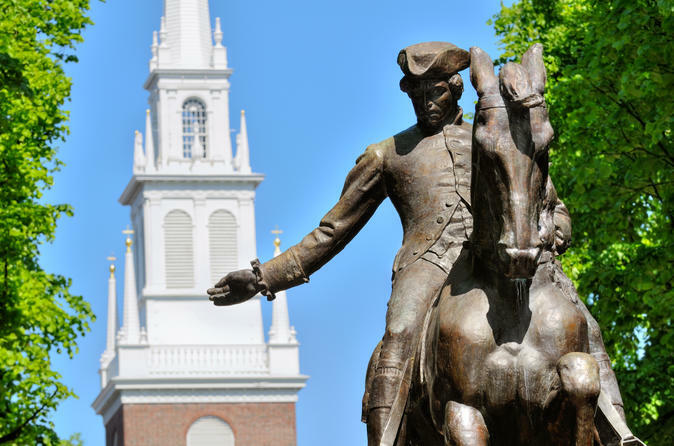 Head out of the downtown area toward Boston's North End to visit the Paul Revere House and the Old North Church. See one final resting place, Copp's Hill Burying Ground, before driving into Charlestown. Cruise over the Charlestown Bridge and see the U.S.S. Constitution in the Charlestown Navy Yard, and find the end of the Freedom Trail at the Bunker Hill Monument. Climb to the top for sweeping views of Boston and the surrounding areas, and bask in the history that you've uncovered! Your tour concludes with transportation back to your hotel or local accommodations.